A tripod and self-timer can do magic. I find that trying to look good or dress up never works for me. Any conscious effort and it's almost guaranteed I won't look as good as I could have. Not to mention I have never been an evening person, no picture of mine looks good under dim lighting and make up doesn't seem to sit properly on my skin, which is when getting dressed up is mostly required. But turn on the lights, bring the sun out on an uneventful day and I'll look a million dollars. Frustratingly enough, my best self comes out on random trips to the library or short walks to the supermarket. The other day I was getting ready to leave to the library when I took a short glance in the mirror and saw that what I had on actually looked good. Picture good. So I took out my tripod, did some neighbour avoiding and came up with these shots during what was probably the only sunny half hour that day. That same day I left the library in the pouring rain, that kept going until the following day, so I guess I was lucky. It was funny how dark the sky was and yet how bright those thirty minutes were. No need for editing with these pictures, I love every little contrast and highlight. Also, London Fashion Week just kicked off so you will be seeing some sneaky pictures this following week! 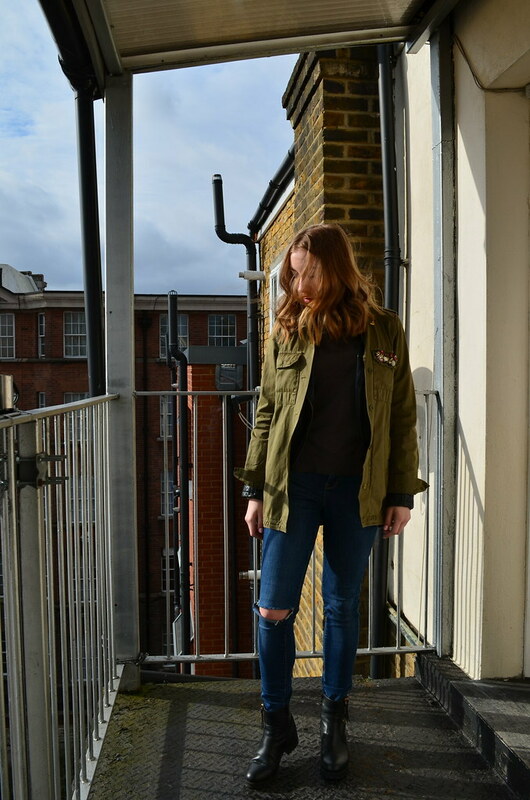 Love love love your boots and the parka is amazing, you look gorgeous Maria!